This was a fun shot. 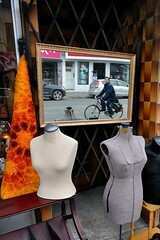 I'd already decided to take the picture of the dummies, but wondered what to do with the empty frame of the mirror because the other side of the street was a bit bland. Out of the corner of my eye, I saw this gentleman approaching on his bike and thought that he would do nicely for a background. I was pretty confident he would look over as he passed, to see what I was shooting... and he obliged. Human nosiness is usually a safe bet. I also realized, over and over again on this trip to Toronto, that a part of me really misses the sheer variety of life and events available in a big city. Ottawa is a pale imitation and the semi-rural area in which we currently live is not even on the scale. Something for me to think about, I suppose, in terms of family, career and retirement interests.